How do I add Music files to the EmoDio playlist? EmoDio is the PC application for Samsung the MP3 Player. Emodio is a newly released file transfer program which replaces Samsung Media Studio. We have applied new display designs that maintain product customization UI and identity. Through TTS(Text to Speech), converting text to voice file, service, you can convert text from Datacast or directly type text to mp3 file. • Album Art auto input and album manage. You can manage songs classified by album through auto album art input service related to free or purchased music. You can work easily work with the multitasking service that handles various jobs at the same time. • Community site Support (www.emodio.com). You can use other user's various contents via community site. • Automatic display of functions needed for each music area. The application automatically shows the functions needed for each of the music areas such as My PC, Store, My Album, CD, and Portable Device, and thus confusion on the user's part is minimized. • Analyzing the user's musical preferences and recommending music tracks online. Styles of music files on the user's PC are analyzed and the result is used for various customized services including the recommendation of online public albums that match the user's musical preferences. You can play music from various albums in My Album and enjoy accompanying 3D effects. User-friendly 3D graphic icons and dynamic albums make using EmoDio fun and easy. • Easy file transfers with drag and drop. The source area containing original files, and the target area to which, the files are to be transferred, are visually distinguished. Various functions like copying, ripping, buying, and making CDs can be executed quickly and easily with simple drag and drop controls. • Easy format conversion of video and picture files. Video and picture files are easily converted to formats suitable for the user's portable device. This area appears when you click the [My PC] button on the navigation panel. 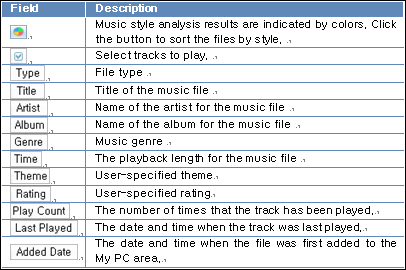 The main panel shows a variety of information such as type, Title, Artist, Album, Genre, Time, Theme, Rating, Play Count, Last Played and Added Date for each file. This area appears when you click the [CD] button on the navigation panel. You can browse an audio or data CD with EmoDio. Note that only audio files and mp3 files are recognized. When you insert an audio CD into the CD-ROM drive of the PC, the application will automatically connect to Gracenote and retrieve information on the files in the CD. You can transfer the files to My PC, Playlists or a portable device. • When there are multiple CDs, a CD list appears first. Double-clicking a CD displays its file list. • Click the [Eject] button at the bottom of the screen to eject the CD. The [Eject] button also appears on the CD list when there are multiple CDs. This area appears when you click the [Playlists] button on the navigation panel. In Playlists, you can view a variety of information such as Album Type (Theme Album, Auto Album, My Album), Image, Title, File Count, Rating and Last Played date. You can create new albums or convert existing albums into the Dynamic Mode. Also, you can use the created albums to make audio CDs or mp3 CDs and transfer their content to a portable device. You can use the transfer control panel to add tracks to Playlists. 1. Click the [Playlists] button on the transfer control panel. • The albums will appear on the transfer sub-panel. 2. Double-click an album from album list on the transfer sub-panel. 3. From the My PC area in the main panel, select tracks to add to the album. •You can add tracks from My PC or CD areas to Playlists. 4. Click the [ ] button. 5. You can enjoy your albums in Playlists area. Windows Media Player Is Not Detecting My Device. What types of file formats are supported by Samsung EmoDio?